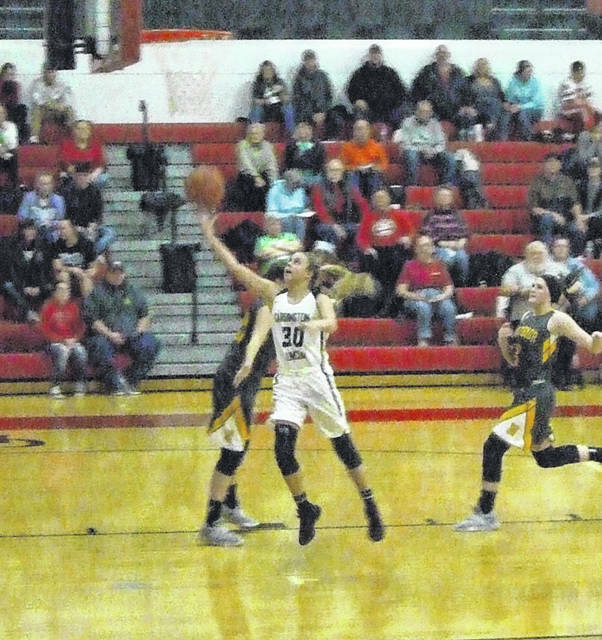 A second quarter run by visiting Northmor turned a 17-4 deficit into a far closer game at 19-13 in their KMAC girls’ basketball game at Cardington Wednesday. Unfortunately for the Golden Knights, with the exception of that 9-2 run, the Pirates were able to maintain firm control over the contest, as they finished the quarter with a 10-2 run and continued pulling away through the second half to win by a 69-27 margin. Northmor coach Freddie Beachy said that Cardington’s height and talent were simply too much for his squad. While Cardington coach Jamie Edwards didn’t feel his team played at their best in the early going, citing a number of missed shots from short range, his team used strong defense and rebounding to control the tempo. Five points from Casey Bertke and four each from Kynlee Edwards and Hannah Wickline staked the home team to a 13-4 lead after eight minutes. A put-back by Paige Clinger and one free throw each from Dana Bertke and Casey Bertke boosted that lead to a 17-4 margin before the Golden Knights began to battle back. Northmor got four points by Lexi Wenger, a three-pointer by Taylor Linkous and a bucket from Macy Miracle in trimming seven points off their deficit and getting within six at the midway point of the second quarter. Coach Edwards noted that Northmor has the potential for a bright future behind their strong freshman class, which includes Wenger and Reagan Swihart, who combined for 20 of their team’s 27 points. After her second basket of the quarter, which made the score 19-13, Northmor would not score again Julianna Ditullio hit from the field in the final seconds of the half. Between those baskets, Cardington got a three-pointer by Taylor Reppart, six points by Casey Bertke and a free throw from Clinger to wind up on top by 14 at the intermission. Things would not get any better for Northmor in the second half. While Wenger scored five in the second quarter and Swihart added three, the Pirates tallied 21 over those eight minutes. Kynlee Edwards hit two three-pointers in having a nine-point quarter, while Wickline added four. Leading 50-23 going into the final period, the Pirates continued to add to their lead, getting six points from Casey Bertke as they cruised to their 10th KMAC win against no losses. Coach Edwards noted that his team is closing in on another league title, as they hold a three-game lead with four conference games left, saying his senior class has a good chance of being the most successful in program history. Bertke led Cardington with a 21-point night, while Kynlee Edwards added 13 and Wickline scored eight. Wenger tallied 15 of Northmor’s 27. Cardington’s Kynlee Edwards gets past a Golden Knight defender for a lay-up attempt Wednesday night as Northmor’s Reagan Swihart pursues on the play.